So this is one of those places that has been on the ever-growing list of restaurants that we hope to visit. Kind of working on a backlog of sorts in terms of visits and giving some of the new places time to work out their little kinks till we get to them :-P . So the reason we went to Zaffran is because some friends swore by the biryani there and we were in the mood for some. 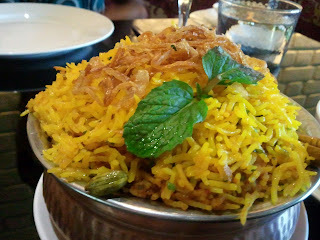 Our new benchmark for great biryani is the one we had at Kebabs and Kurries recently. I can actually taste it as I am typing away. Anyways, got here and we were way past the usual Sunday lunch hour, entering at around 2.30 PM. Nevertheless, there were people walking in after us. Once we settled down, something cool was definitely in order - Bangalore's heat is ridiculous. Whatever happened to "Garden City"?? Sudhakar went in for the watermelon cooler and I really liked the sound of a Kacchi Kairi Margharita - this was green mango with some fizz, chillis, chat masala and coriander. 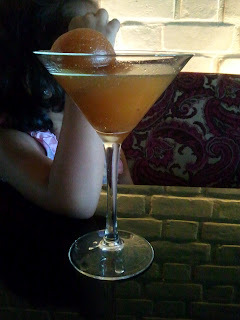 It was really nice - the absolute green mango-chilli drinkable version. 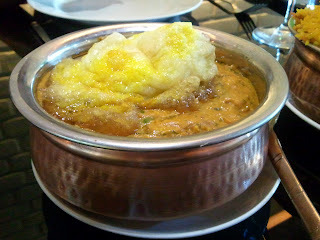 For starters we had the Murgh Zaffrani Tikka. Marinated in curd, chilli and a host of other familiar spices, the tikka showed that Zaffran knows how to treat their meats. The surprise came in this tiny hint of rose - something we tasted at K & K as well. It adds a whole new dimension to the taste and not in an overpowering manner. The usual accompaniments of raw onion rings, green chillies and curd-mint chutney were served as well. A starter that was well appreciated. For junior it was the aloo stuffed paratha. Again, she loved the paratha so much that she asked for another one, but I decided to hold on and serve her the biryani instead. 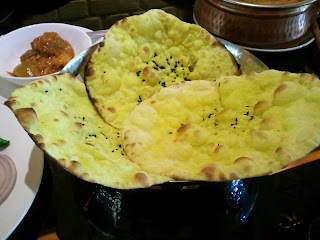 For the main course we went in for Zaffrani Taftan - soft, saffron infused breads which went really well with the Murgh Afghani. The white that you see on top of the dish is deep fried egg white, which though tasty was loaded with oil and after a few bites got a little to greasy to eat. But the gravy and the meat were really nice and it also went down with the little one well, which helped it score some more with us. And finally the Ghosht Biryani. The quantity is substantial and since this was the reason we were here we couldn't wait to get started. But just one bite into the biryani and we were really disappointed. The meat and the rice were definitely not cooked together and the masala used was very average. Honestly I would put an Andhra chain biryani over what we had that day. Maybe we were late and this was a last minute fix, but this is not a biryani I would recommend. 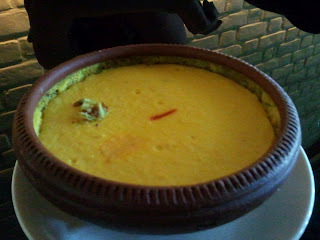 And to round it off, to please junior we ordered Gulab Jamun and the Matka Phirni. Two Gulab jamuns to the serving, one of which disintegrated on first touch. The sugar syrup was more of a bath for the jamuns and when the second one disintegrated as well on touch, it just became a jamun sludge and blech! The phirni on the other hand was nice and substantial in quantity. We came for the biryani, but loved the starters instead. The ambiance is nice and the staff know their menu well. Service is quick enough. This meal came close to the Rs 1500 mark. Now that we know what to stay away from when we come next, we most probably won't think too much of the misses that were served. The loo is clean.